Chicago’s highly anticipated cider bar brings an impressive array of ciders from all over the country, and we can’t get enough. The one thing I was most excited about when I was getting ready to visit the Northman—a bar on the border of North Center and Lincoln Square that we’ve been waiting two years for—was the Spanish long pour cider. It’s the one that gets poured from a tap close to the ceiling, is unfiltered and uncarbonated and gets its bubbles from falling from such a high place into a smaller vessel. It’s quite a sight, and a good experience for anyone looking to learn about cider. And you will learn something; a night at the Northman is an education in cider. 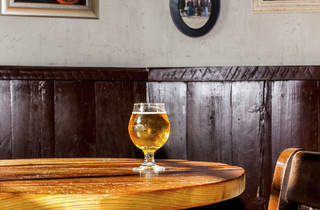 Run by the Fountainhead Group, the Northman is Chicago’s first cider bar and one of just a few in the country. While it may feel like we’ve been waiting a long time for the bar, the trend of cider is just now on the upswing, departing from the heavily sugared drinks that have long dominated the country’s cider market. 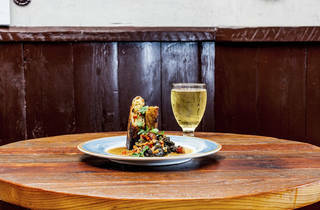 The Northman’s menu is pages upon pages long, filled with ciders from England, Spain and the U.S. (to name just a few), which can be overwhelming when you find drinks that range from sweet to semi-sweet to dry and you have no idea where to begin. Not to worry, your server will be right there to help you find one to fit your palate—the staff is filled with serious cider geeks. 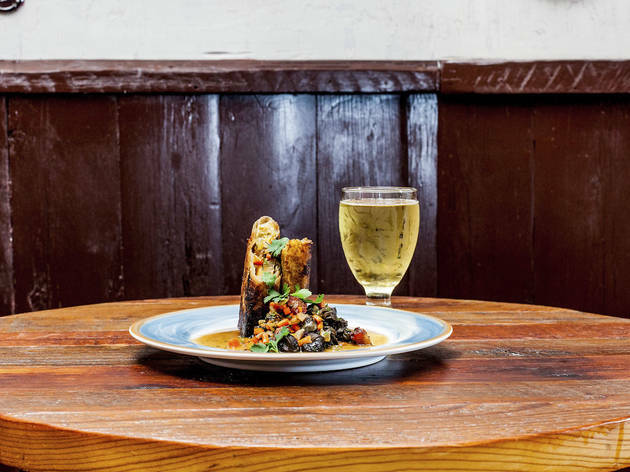 You’ll start your night with an amuse-bouche of sorts—a sip of the Northman’s house cider—before settling on your first of many ciders (the list is constantly rotating). 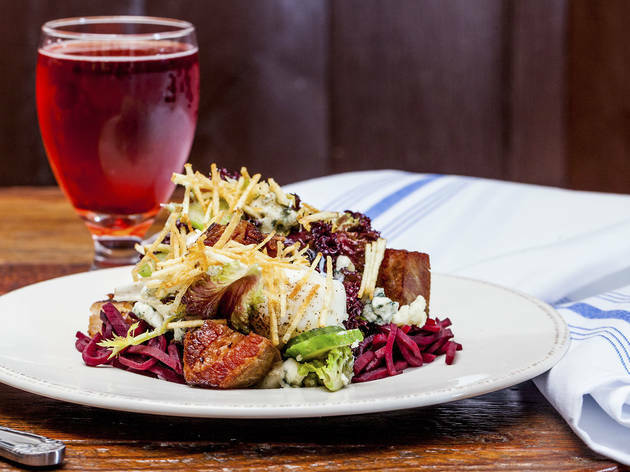 Move on to the food and order some shared plates, or maybe just some cheese and the Ploughmans Platter, because while the cider list is impressive, the food is less so—pleasing but mostly incidental to drinking. 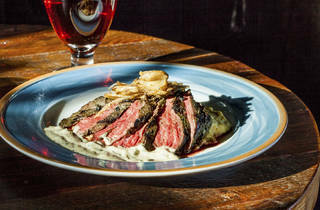 That’s fine with us, as the Northman is first and foremost a cider bar that also happens to serves pub food. If you’re going to eat, get the melt or the hearty fish and chips, both served with fries. Make sure to ask for the curried ketchup, which lends a warm kick to anything you dip in it. After you’ve had your fill of the regular ciders, splurge on a calvados (an apple brandy originating in Normandy) or ice cider (made similarly to ice wine). Both varieties lean a bit sweeter and are served in smaller pours—a perfectly delicious way to finish off the night. Cider novices need not be intimidated, just ready to learn a bit more about apples and how ridiculously delicious cider can be—even if the food doesn’t quite hit the high notes. Start to finish, the Northman delivers excellent and knowledgeable service and a hefty array of ciders you’ll want to drink your way through. 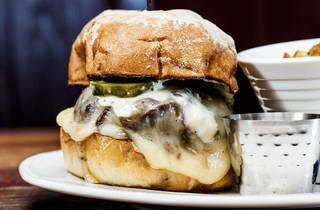 Atmosphere: The space feels like a comfortable neighborhood bar, with a wood-heavy interior, tall booths and a long bar. 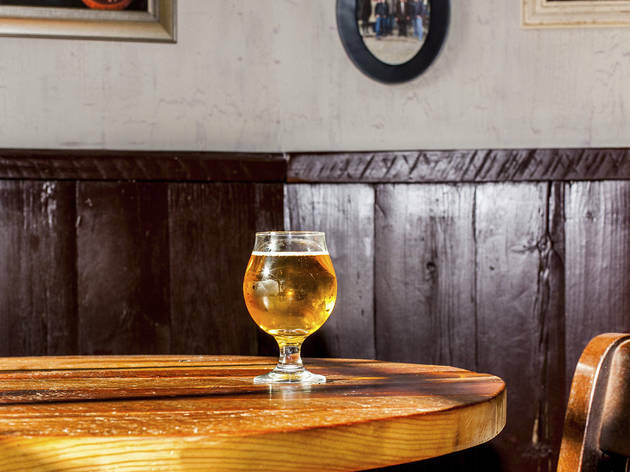 What to drink: The Spanish long pour cider, for the experience. I loved the sweet and floral Neige ice cider and the Roger Groult 12-year calvados—a bright and complex way to finish your cider experience. 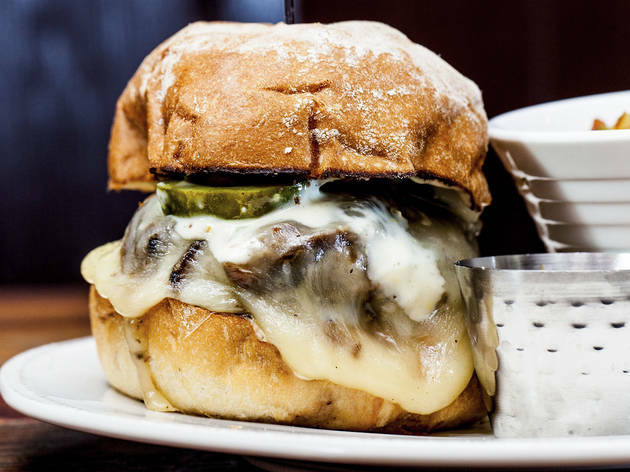 What to eat: Get the melt or the fish and chips (and don’t forget to ask for curried ketchup). Where to sit: We enjoy the bar to get small glasses of the Spanish long pour (only larger portions are available via table service), but you’ll want to grab a booth or one of the front tables if you plan on settling in for a bit with snacks. El stop: Brown to Montrose. Bus: 78. I think that this restaurant was super smart to corner the market on cider restaurants, and I imagine it'll do pretty well for itself. I dined here in a group of about 12 people, which they did have trouble accommodating. We squeezed into a booth for eight. But I don't think anyone tried to call in advance and ask, so that's fine. I really enjoyed sampling a bunch of ciders, which I don't usually drink. It was fun for something different, and I'd happily go back for drinks alone. The food was good, not great. I enjoyed the comforting beef stew (with slow-cooked beef and beef cheeks), but the falafel wrap was underwhelming. Also, the server did forget to bring a few of the entrees we ordered. Overall, a nice experience though. 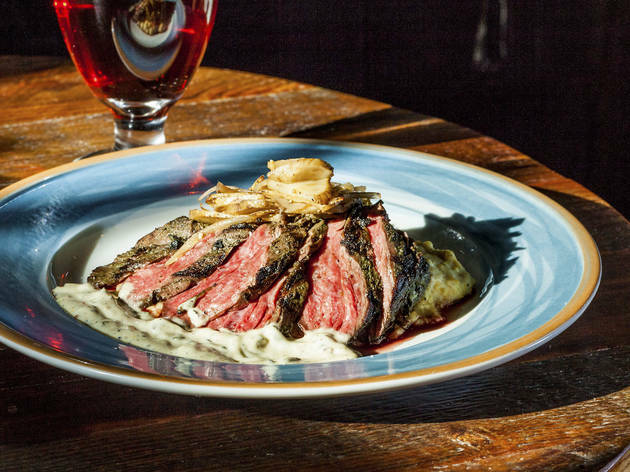 The Northman is a KILLER addition to the neighborhood! Loads of good things to say about this place. The atmosphere is chill, beautiful, super inviting, and cozy. Staff is very well educated on the ciders available, attentive, and make you feel like family. Good tunes in the background and not overly loud. The menu has lots of different options like charcuterie, fish and chips, a yummy burger, delicious steak, etc.! My favorite part is the awesome presentation with one of the most delicious ciders I have ever tasted! You must go to see what I am talking about! With this place being such a hit you will most likely have to wait a bit but it is definitely worth the wait. GO GO GO! Great new addition to the neighborhood! Incredible cider selection from all over the world, delicious food, and a great outdoor patio! Full disclosure: I am not the biggest cider fan. As such, I was a tad skeptical when some friends invited me to give this place a try. I'm glad I tagged along though because the Northman is fantastic and you should go. As stated, the staff is keen to help you discover something new and they all know their cider, giving you the lowdown without making you feel dumb for not knowing all these things already. Tell them the kind of flavors you usually go for and they can point you to a cider that you will love! Excited to try some of the cider cocktails next time, or to head back on Tuesdays for a cider flight. I'm so happy the Northman is in my neck of the woods. The list of ciders is huge and has a variety of styles, from sweet to dry to just plan unusual (habanero cider! cider with hops! ), they have a handful of cider cocktails, and they also have a calvados list the way other places have a whiskey list (ah, to not be poor and be able to make my way through them all). The food is good too - the fries come with a black garlic aioili that I love, and the doner kabob has yet to disappoint anyone I know who has had it. One thing I wish they would change: currently you can only do cider flights on Tuesdays. This doesn't make much sense to me, and I wish they would be available all week. Ahhhh, I love this place! As Chelsea M mentioned below, if you're a fan of cider, this place is for you. HOWEVER, I'd also add that if you are NOT a fan of cider or have had limited exposure, this place is ALSO for you! This place took forever to open but now that they're live, all is forgiven for the ridiculously delayed opening date. This cider menu is extensive. Pages and pages..dry to sweet, even offering a selection of calvados, oaked everything, etc. Some of the ciders my hubby and I ordered tasted like wine and it's impossible not to come out of here trying something totally unique and even discovering a new favorite. Some fun ones: We ordered a cider with the nickname "the long pour" because the tap is literally affixed 5 feet above the bar and carbonates as it hits the glass. It's a fun little show if you're sitting at the bar. My FAVORITE thing I ordered was this amazing drinking vinegar. Sounds disgusting and I was convinced I was the only one who orders it, but if you like shrubs, this is totally for you. Tart, sweet, and really awakens your taste buds. Four stars because the entrees are kind of meh. Starters are strong and I'd stick with ordering those and sharing family-style. The decor is also so so charming. Enjoy! And order the drinking vinegar so that it never goes off menu! kthnxbye. If you are a fan of cider, this may be your new favorite place in the city! After much anticipation, this friendly neighborhood cider bar is finally open! The decor resembles a charming English pub and when you walk in everyone is given a complimentary sample of the house cider. The knowledgable staff takes it from there - whether you prefer a sweet, dry, sour, or "funky" taste. I was impressed with a fruity choice from Seattle and a semi-sweet from France. A friend also had a honey lemon mead that was delicious. While we enjoyed the cheese plate, the rest of the food was posh with the price tag to go with it (think $18 fish and chips). The bar also has cider cocktails, beer, and apple brandy, which I will definitely be back to try! Besides the several hour long wait that comes with a two year anticipation, this place is so wonderful. Everyone is extremely knowledgable and enthusiastic about cider without being snobbish. Always ready with a recommendation and an explanation. 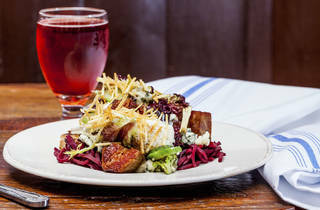 The Northman has something for everyone, whether its sweet and local or the most funk filled Basque or Normandy cider. Food was pretty delicious too. The Jalfrezi Curry was on point, but a little pricey for such a small portion. The fabada, a Spanish style bean stew with pork belly, was full of flavor and hearty enough even for a super hungry lady like myself. Once the frenzy subsides this will be my preferred neighborhood chill spot.